After completing a degree in pastoral and family counseling, you’ll better understand how to counsel others and foster their religious and spiritual sides. College degree programs of this type are usually available through private colleges and religious universities that want students to tighten the bond that couples and families have. While you can use your degree to work for your church, you can also find counseling positions within nonprofit and religious organizations. 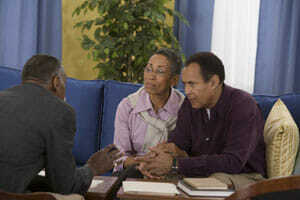 Marriage counselors specifically focus on the bond between a husband and wife. During your studies, you’ll learn how to combat the most common conditions that affect marriages, including infidelity, money problems and frequent arguments. You usually work with your clients together, but you may see the husband on one night, the wife on another night and then work with the clients together. After earning your degree in pastoral and family counseling, you need to take the licensing examination available in your state before practicing. Marriage counselors with a pastoral degree often use faith-based treatments that teach couples how to use the teachings found in religious books to help their home lives. The Bureau of Labor Statistics found that marriage and family therapists make a median annual wage of $51,690 and that the top 10 percent of counselors make more than $70,000 a year. Though some people group together marriage and family counselors under the same heading, family counselors often examine issues that affect the entire family unit. Parents might not want to discuss infidelity in front of their children, but they will want to talk about the fighting that occurred after one partner lost his or her job. Family counselors also meet with the children in the family unit and discuss other issues, including problems with self-esteem and any criminal activities that the children did in the past. Kids who vandalize private property or shoplift often meet with a family counselor. You do not need any type of special license to work as a job counselor, but working in this field will give you the chance to help thousands of people. Unemployed people and those dissatisfied with their current places of employment seek out job counselors for help and support. Counselors often give clients assessments and tests that determine their skills and the areas they would do best working in later. You can also discuss job training and going back to school with your clients. When you complete your degree in pastoral and family counseling, you might consider working as a youth minister. Kids today face a number of problems and issues both at school and at home, and they often don’t want to discuss those issues with their parents. As a youth minister, you provide the compassionate ear that those kids want. You’ll also minister to the kids from the Bible, talk to them about how they can apply the lessons they learn from that book into their daily lives and help them feel more comfortable about themselves. Students today often look at the types of jobs available to them after college before deciding on a major and a degree program. Though a degree in pastoral and family counseling might sound limiting to you, you can use your degree to help kids, families and couples as a counselor or minister.